Breakfast at 7:00. The admins must boil 2 pots of water again for people’s oatmeal, tea and coffee, which means we admins need to get up with the howler monkeys at 5:50 and need to rekindle the hopefully still hot embers – by the time I get to the fire at 6:00, O already has it going, bless his heart! Fire is blazing and water is on! 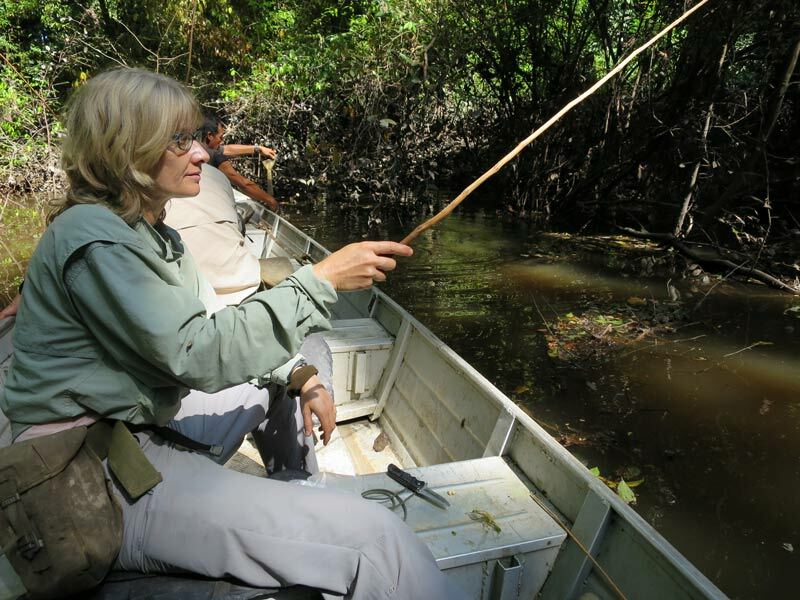 At 8:00, we leave for a day of fishing: everybody gets in the boats with yariyari rods and belt kits. We drive for a bit and then turn off into a side arm of the river. 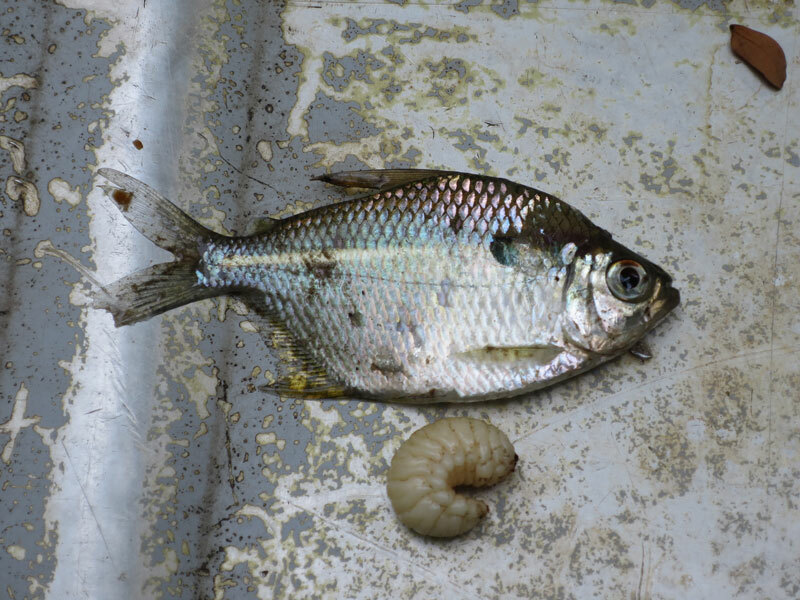 We fish for a while and I catch one little bait fish, but lose a bunch that fall back into the river. And of course, I lose bait to nibbling piranhas. Then we move on to a different spot, where we try long line fishing: the wooden spool with the stronger line and the larger hook is our long line. You hold the spool in your left and throw the hook with your right, like a ball. The line then unravels from the spool and the hook can fly pretty far away into the water. Some people reel it in right away, some wait. Ian says he’s usually too impatient to wait very long, but I watch him and his line isn’t moving much. 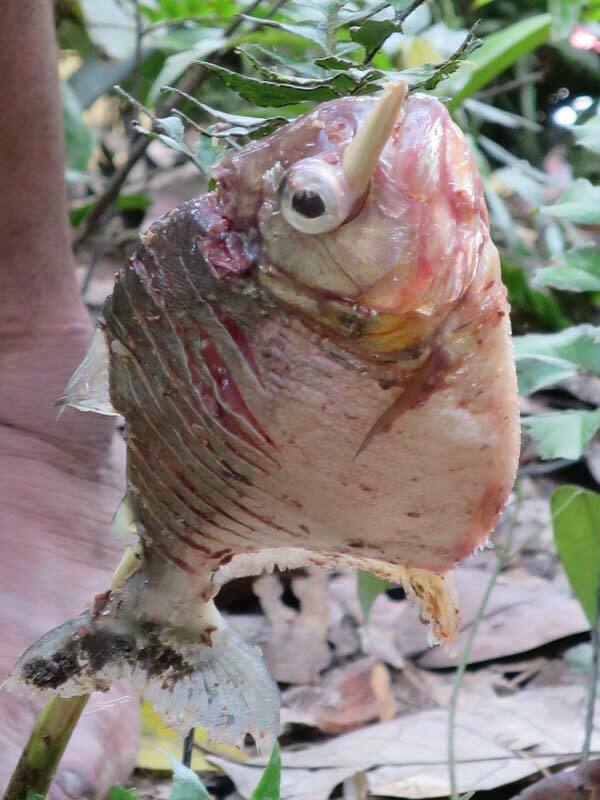 Same nibbling issues: piranhas are eating my bait! And when I pull out, I either don’t have one on the hook yet, or I have lost the bait. My only consolation is that nobody, not even Lionel or Ian, pull out any larger fish. We return to the campsite around noon and a new group of admins has to boil water for lunch. I bring some of the goodies in my food bag with me for “prison trade”: when we got the rations, Ian told us not to be picky and to just take whatever he was giving out, and that we would be able to trade later. He told us to take even things we don’t want because they will be valuable as trade-ins. So, I’m looking to trade in my water bottle cup: last night I noticed that it is leaking. This morning, Ian glued it with super glue but I’m not crazy about drinking hot liquids out of a cup with superglue. Personal choice. So I’m bringing stuff to trade to get a different cup. Basically, I’m offering the entire contents of my ziplock, combining yesterday’s and some of today’s foods: oatmeal, sardines, coffee, candy. I barely make the offer, and already get two people saying yes. J was first. He says he only wants the sardines. DONE! He says I made a bad trade: he would have given me his cup anyway, for nothing, but he’ll take the sardines if I’m willing to give them up. Hell, yeah! For a new cup? Absolutely! Before lunch, Lionel shows us how to clean and gut fish. Here, all fish get eaten by something bigger and badder, and they all have developed some defenses: sharp teeth, sharp barbs on back and belly, lots of bones, etc. Even if you just touch the fish, you can hurt yourself. Lionel shows us what to cut where, how to open the belly and not cut the internal organs (they spoil the meat; you can still eat it, but it tastes bad). Then he shows how to scrape the scales off since they taste nasty too. And finally, he shows us how to thread a fish onto a spit (stick made of green wood, with the bark shaved off). 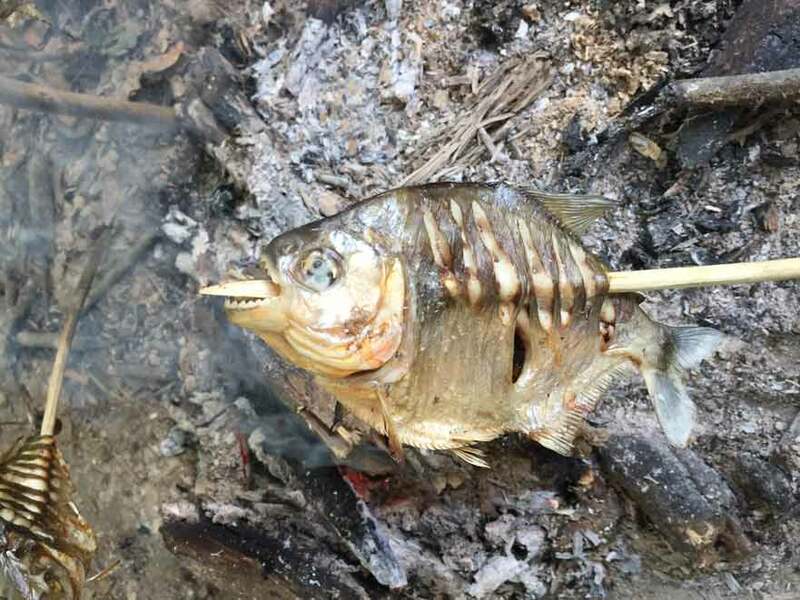 We didn’t get that many sizeable fish, but we have three that the admins are now roasting by the fire. 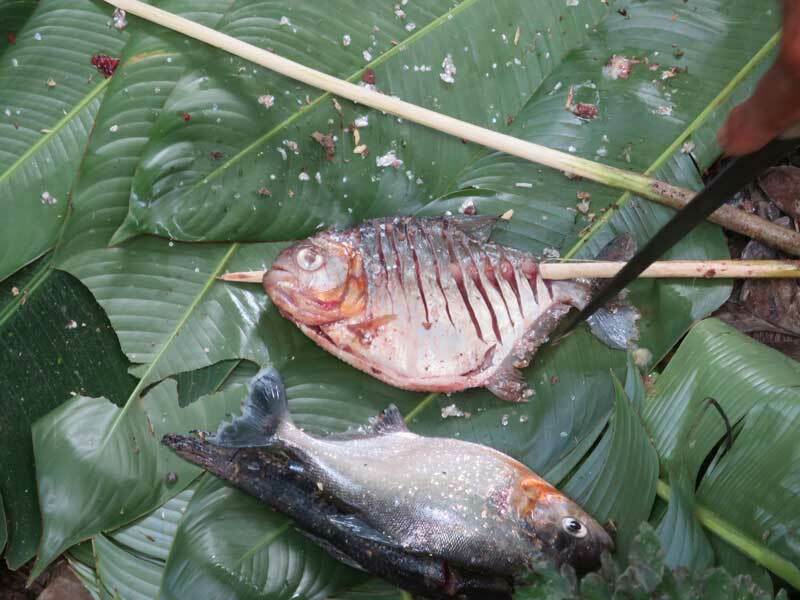 We all get to try them later – my piece of piranha tastes pretty good, like other fish. Definitely doable. We have some free time to do stuff for ourselves, and then come back to the admin area for an early dinner at 4:00. At 4:30, we leave for an extended fishing trip. Again, we fish for quite a while, but come back almost empty-handed. One or two catfish, including one that “talks” (can breathe under water and in air and makes weird keening sounds when pulled out of the water). Not a super success by way of food, but the stars are amazing out here. Aside from the fact that the sky looks a little different in terms of where the constellations are located, there is zero light pollution and you see stars you never see on the East Coast back home in the US. You can see the whole Milky Way! It’s beautiful. When Ian looks up at the stars, his headlamp slides off, into the water. He tries to find it, but it’s impossible in the dark. He’s bummed: his headlamp is more powerful than any of ours and now it’s going to be hard to see animals on the riverbanks on the way back. Back at camp, the admins make some more hot water. People have tea and coffee, and I eat my ramen noodle soup that I had been saving. Yum!